This guide is no longer current. Please follow this guide instead. 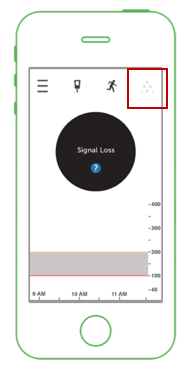 Users with a Dexcom G5 can use Nightscout by configuring the Dexcom G5 Mobile App to “Share” and setting up a Nightscout site with bridge variables. The Nightscout “bridge” site retrieves data that has been uploaded to the Share servers and stores it in your personal database for use on your Nightscout site. After clicking the icon shown above, follow the on-screen prompts to set up and/or log into the Dexcom account and begin “sharing” your G5 CGM data. Once your device is successfully sharing data, you can use the Dexcom Follow app (if available for your device) or one of a variety of smartwatch solutions. Please consult the CGM Watchfaces page to view options. You can also set up Nightscout to enable viewing of Dexcom data from any Internet-connected browser. Please consult the step-by-step directions for setting up a Nightscout bridge site.